We have two male yorkies and every year they get Christmas presents just like the rest of us, so I thought I would show you what I managed to find this year. The Company of Animals is a great website to use when looking for treats, gifts, training resources and even pampering products for your pets. 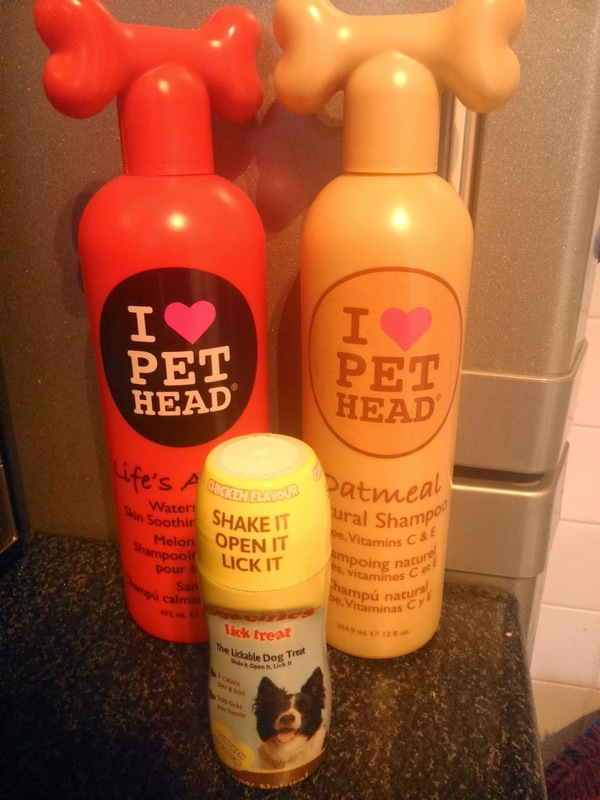 I tried The Pet Head Life's An Itch skin soothing shampoo for my dog Bailey as he has sensitive, itchy skin so cannot be bathed in standard dog shampoo. This shampoo is brilliant because it relieves skin irritations as the oatmeal and aloe vera ingredients soothe the skin. It also contains tea tree oil which helps to purify and moisturise Bailey's coat. And my favourite thing about this shampoo is that it's watermelon scented so Bailey literally smells good enough to eat! For my other dog Benji, I tried the Pet Head Oatmeal Shampoo which contains shea butter that helps to give a glossy coat, and mango, coconut oil and aloe vera which all help to give it a gorgeous scent too. My boys love food like any other dog, and Coachies Lick Treat were something different from their usual biscuit snacks. This looks like a roll-on deodorant and the dog literally licks it to get their treat. We tried the chicken one and at first the boys looked at me as if I was crazy, but after a few sniffs they gave it a try and it was a hit! Another favourite has been from the Pooch & Mutt healthy eating range. Their Bionic Biotic is a natural supplement that helps stop my dog Bailey's itchy, flaky skin condition and it also helps him to have a healthy coat. Both boys like the Charity Chicken treats, and I like it because it's low in calories so I don't feel bad for giving them treats, which will be helpful on Christmas Day when they are surrounded by the sweet smell of various meats! I'm also thinking about baking the boys some healthy, but tasty dog treats so watch this space for the recipe! For the purpose of this post I was sent Pet Head shampoos, Coachies Lick Treat and Pooch & Mutt products. No payment was received and all opinions are honest and my own. Love the caps on those bottles. Like the Pet Head shampoos. Good 'present' ideas. Fantastic! I'll be doing that. Thanks. Some pooches are in for a pampering this Christmas.